while others seem to delight in showing bottles of absinthe in the most interesting situations (as this is a respectable blog, I'll only show a respectable picture). And now there's a new discussion group on MySpace talking about Real Absinthe. Entry is free, there are always a few experts on hand to give advice about the best absinthes to buy, and where to go to buy them. The conversation can get heated especially as the evening turns to night, and one can imagine rapidly emptying glasses or bottles of absinthe next to the computers of those late night posters. Of course I am posting this at 6:10 in the morning while "chatting" to the late night revellers in New York and early evening posters in California and the Pacific, so our perspectives may be a little different. But that's the joy of MySpace, the internet and, above all, of absinthe! 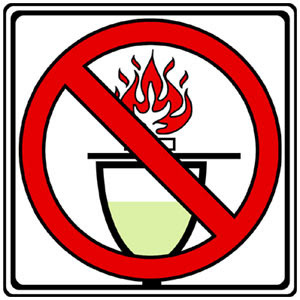 Rant of the day - real absinthe is NOT for burning! UPDATE OCTOBER 2009: IF YOU'VE COME TO THIS PAGE VIA A GOOGLE SEARCH FOR ABSINTHE SINGAPORE, SKIP TO THE COMMENTS BELOW AND ALSO BECOME A FAN OF ABSINTHE IN SINGAPORE ON FACEBOOK. LOOK FOR OTHER ARTICLES ABOUT ABSINTHE IN ASIA ON THIS BLOG BY CLICKING HERE. UPDATE MAY 2009: IF YOU'VE COME TO THIS PAGE VIA A GOOGLE SEARCH FOR ABSINTHE MALAYSIA, SKIP TO THE COMMENTS BELOW AND ALSO LOOK FOR OTHER ARTICLES ABOUT ABSINTHE IN MALAYSIA ON THIS BLOG BY CLICKING HERE. NOW BACK TO THE RANT FROM 2007! I've been reading more absinthe horror stories on the web. It seems that many of these bad experiences of absinthe are because of drinking the wrong sort, i.e. drinking Czech absinth. 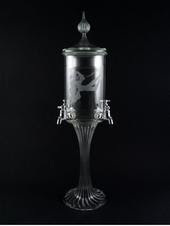 Originally absinthe was from Switzerland and then from France. 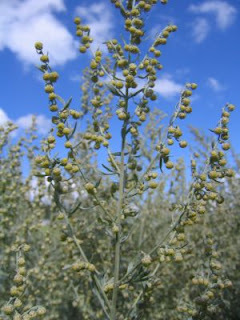 The area around the Swiss/French border has the best growing conditions for some of the main plants, including wormwood. In the 1990's, Czech products called absinth, but with very little similarity, first appeared. Most play on the fact that it should be flamed and burnt, showing how little respect the Czech distillers have for their own creations, and building a negative image for the whole category. Now real absinthe has returned, much of it from its original birthplace in the Val-de-Travers region of Switzerland. There is an ever-expanding group of absinthe lovers all over the world, drinking absinthe for its taste and not for its effects. And this is how to prepare real absinthe: no burning, please. There is also the option, as favoured in Switzerland, to add just cold, fresh water. No sugar at all. Now real absinthe is legal to buy in every non-Muslim country in the world except for the USA. And as people discover the pleasures of drinking real absinthe in the right way, it will probably get even more popular. Santé! 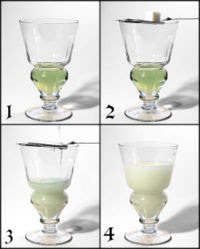 Learn how to make absinthe? Don't make absinthe at home. Don't even try. It's probably illegal (depends where you are) and it won't be anything like real absinthe. It may even be highly dangerous. La Clandestine now does two week courses in Switzerland for would-be distillers. For just $50,000 plus accommodation and food, you can learn all about the plants (including wormwood, fennel etc), the process and the pleasures of real absinthe. You won't learn everything that we have: that has taken us many years of trial and error. But at least you can learn what not to do and you'll taste some great absinthes while you are learning. Contact me at alan"AT"absinthe-suisse.com for more details. I wrote that you will learn what not to do. In case there is any confusion about this, we don't want you to make absinthe at home after you have been on the course. But we think you will have a great time with us in Switzerland! 1) Get the licences to permit you to distill. 2) Get the right equipment (you can see some of it here) . 3) Set aside a few years of your life to get it right. 4) And if you are doing this in the USA, have patience. You won't be able to sell it. Taking short-cuts will probably be illegal and expensive (fines and a police record too); it may even be fatal. Do I need to say more? From the birthplace of absinthe ... to a bar near you soon! La Clandestine is hand-crafted absinthe, made with passion and the attention to detail that has made Switzerland famous. With production limited, it is not the intention of those involved in La Clandestine to sell it everywhere, but in the next few months La Clandestine will start to appear in some famous bars - and maybe a few smarter boutiques - around the world. First stop: London, where La Clandestine has been well received by some top barmen already. Next stops: Netherlands, France, Spain, Japan, etc. Add your favourite places where you can drink or buy La Clandestine. And add places where you think La Clandestine should be sold ... but isn't. 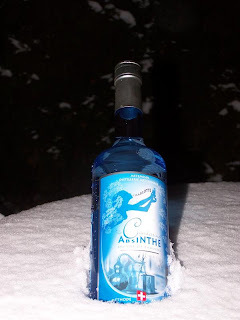 January 14th .. nothing special about today .. except it is the launch of the Real Absinthe Blog. I'm Alan, and I like to think that I'm a drinks marketing and sales specialist. I'm based in the UK; I travel the world to sell and promote high quality drinks. Why am I qualified to write this? I can't make absinthe and my taste buds are not the best in the business. I think I am qualified as I have launched absinthe in over 15 different countries and on every continent in the world (except Antarctica, that is). I have launched two of the main internet sites selling absinthe. And played a part in the development of two absinthe businesses. All that would count for little if I didn't also have a love for absinthe and a passion for making absinthe a major drink in the 21st century. So welcome to my blog .. let me know what you think .. and santé! Oh, by the way: The opinions expressed here are purely personal and do not necessarily reflect the views of the people with whom I work.